The best inventions take a problem and present a simple solution, thus providing consumers with a product they inherently want. 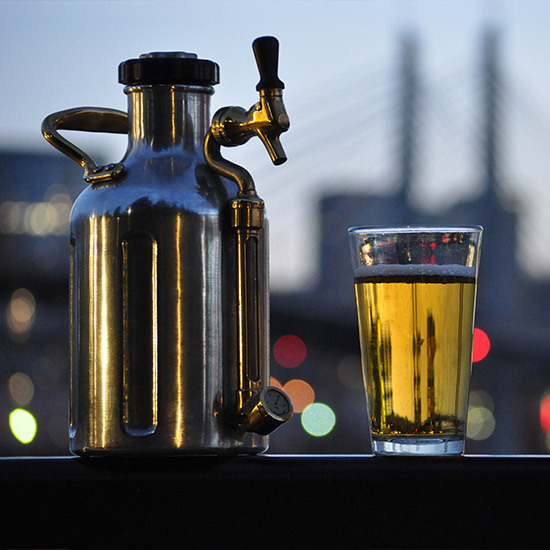 A new Kickstarter is setting out to solve the biggest problem with the beer growler: after a few days you have flat, old beer. Considering that they blew past their funding goal in the first couple days, they appear to be on to something. In some ways, the growler has become the de facto mascot of craft beer. The trophy-sized jug lets drinkers proudly transport fresh draft beer home from breweries or bars, freeing them from the limited choices of bottled and canned products. But that promise of freshness is also the growler’s undoing: since most growler fillers don’t pressurize their product, what you’re bringing home is essentially a 64-ounce open beer. And anyone who’s ever tossed an open beer back in the fridge knows time is not on your side. A company called GrowlerWerks is hoping to help end that ticking clock with the uKeg—a pressurized growler. This refillable, re-pressurizing product promises it “doesn’t let air into your beer, maintains perfect carbonation from the first pour to the last, and keeps beer cold for hours.” Though shaped and sized like your typical growler, the uKeg is more like its namesake—a miniature keg. It fills through the top, but then the brew gets sealed in with a CO2 regulator cap and pours out a tap on the side. It runs on simple, 8-gram, food-grade CO2 cartridges, and the company claims that one cartridge keeps a growler fresh for up to four weeks. Apparently, the uKeg was priced right at $99 (or $79 for those who hopped on early): the product is set to go into production after GrowlerWerks met their goal of raising $75,000 with 51 days left in their Kickstarter campaign. A shipping date is set for May 2015. Sure, the uKeg doesn’t fix one of the growler’s other biggest problems: that you actually have to remember to bring it with you when you want it refilled. Still, a 64-ounce device that pours fresh, cold beer anytime seems like the kind of thing you might want to carry around with you pretty often.